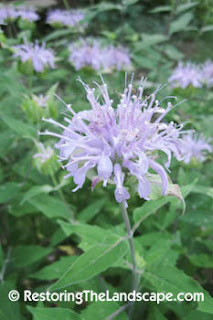 Wild bergamot is a great native perennial plant that thrives in full to part sun. The light pink tubular flowers are arranged in clusters at the top of the stem. The fragrant gray-green leaves are opposite on the square stems. 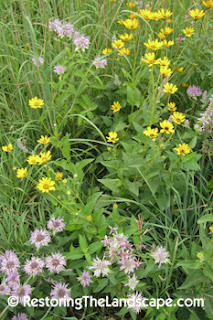 This native flowers from late June to early August in Minnesota. The flowers are nectared upon by many types of insects, especially those with long 'tongues', as well as hummingbirds. Day flying moths will nectar on Wild Bergamot. 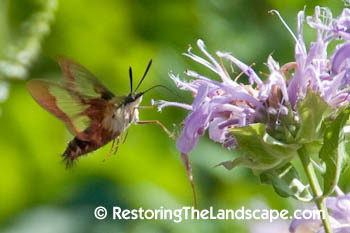 This photo shows the Hummingbird Clearwing Moth (Hemaris thysbe) nectaring. I have also seen the Snowberry Clearwing Moth on the Wild Bergamot. Read an earlier post here on these moths. 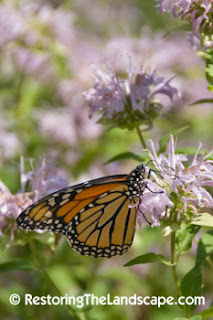 Many types of butterflies like Wild Bergamot, we will often have several Monarch Butterflies on our Bergamot. Skippers and swallowtails also like to nectar on this native. 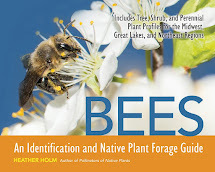 Also look for several types of bees on the Wild Bergamot. Wild Bergamot was used extensively by Native Americans for many purposes. One of the most well known is the use of the leaves as a tea. Other enthobotanic uses included culinary and medicinal uses. 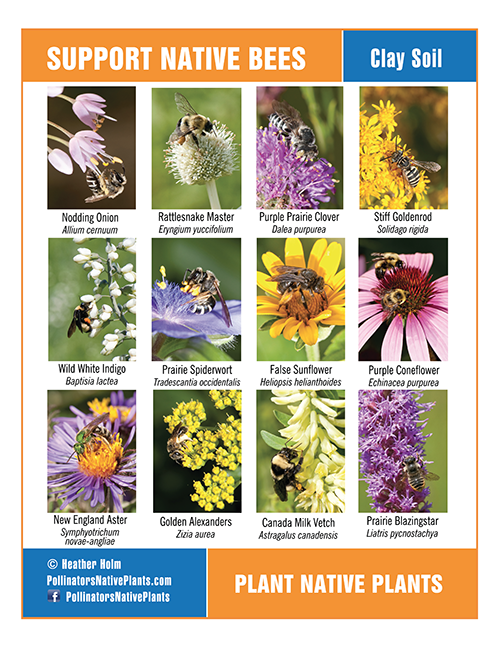 Read more about these on the USDA Plants Database Fact Sheet. In the late fall the seed will be sought out by chickadees and sparrows. 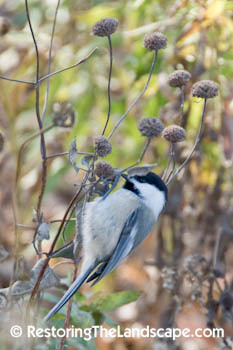 The dried round seedheads are an attractive feature in the garden alongside prairie grasses that are turning their golden hues in the fall. Wild Bergamot is native to most of North America except California, Florida and the Atlantic provinces. The similar east coast native Monarda didyma has been cultivated by the horticultural industry as an ornamental. 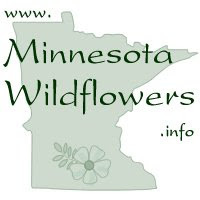 The other common Monarda species in our area is Monarda fistulosa (Spotted Beebalm). Read an earlier post about this plant.